A packed hall; was treated to the inimitable delivery of Lucinda Lambton (without doubt a national treasure) when she spoke on June 24th about the Queen Mary's Dolls' House, the magnificent little bulding created between 1921-24 under the guidance of Sir Edwin Lutyens, renowned at the other design extreme as the architect behind much of New Dehli, in India, as well as iconic country houses. 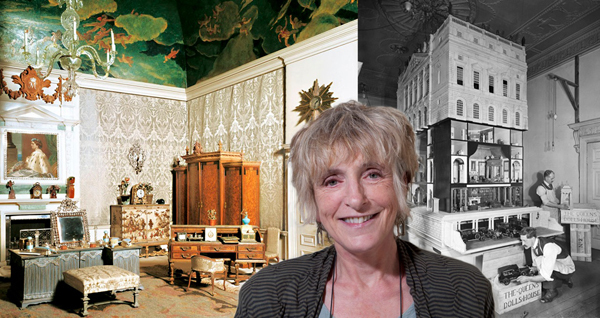 During her talk, Lucinda listed a string of eye-watering details - over 1,500 people worked unpaid on the building, which weighed 4.5 tons, including some of the finest artists, craftsmen and manufacturers in the early 20th Century. Their work in miniature featured a set of cutlery with over 2,000 pieces, a flushing toilet, hot and cold running water, as well as working lifts. There was also a gramophone five centimetres high, miniature frescoes and portraits, plus tiny embroidered towels, which took hundreds of hours to complete in a model perfect in every aspect. Lucinda explained that Lutyens's vision was to capture life in a royal residence in every detail. The library included original works by the top literary names of the day and about 200 authors, including Rudyard Kipling, Thomas Hardy and A.A. Milne, produced original hand-written works for the library and Sir Arthur Conan Doyle created a Sherlock Holmes story, How Watson Learned the Trick especially for the Dolls' House. Amazingly, the house also contained a fully stocked wine cellar filled with 1,200 thimblefuls of Champagnes, wines, spirits and beers from Berry Bros of St James's, London. Royal gun makers, James Purdey & Sons, donated working replicas of King George V's guns, complete with leather case and a magazine of 100 tiny cartridges. The house also boasted a five-bay garage, which contained a Daimler and a 1923 Silver Ghost limousine. Lucinda also pointed out the many Royal reminders dotted through the house. In the salon, there are two tiny thrones, side-by-side, and there is a collection of red and green leather dispatch boxes, each embossed in gold with the royal cipher. There is even a fully-operational strong-room to hold the Crown Jewels - weighing 1.5lbs, rather than 1.5 tons. Royal portraits included a copy of Franz Xaver Winterhalter's 1846 painting of Queen Victoria, Prince Albert and their children, as well as contemporary portraits of the young Prince of Wales, King George V and Queen Mary. The domestic quarters and the rooms below stairs were given as much attention as the grand rooms above. In the kitchen, over 2,500 tiny sections of oak recreate a wood-block floor and a copper kettle, made out of a King George V penny, is on the stove, whilst three ivory mice, in a humane mouse-trap, are forever under the gaze of a ceramic cat. Every detail of domestic life was included, from lavatory paper, Lux flakes and Sunlight Soap, to a tin of Coleman's mustard and a bottle of Lea and Perrins Worcestershire Sauce. In the living quarters, chamber pots can be seen under every bed, trouser presses await use in the men's bedrooms, and reading material is on hand for the servants. In a letter of thanks to all those involved, Queen Mary described the Dolls' House as "the most perfect present that anyone could receive". In 1924, it went on display at Wembley Park as part of the British Empire Exhibition of Arts and Manufacturing, where it was viewed by 1.6m people. The following year the Dolls' House was put on permanent display at Windsor Castle, in a room specially designed by Lutyens, where it remains to this day. Over a hundred people attended the talk, with many copies of Lucinda's books sold - including her latest offering, Palaces for Pigs, a celebration of fantastical buildings constructed for animals and The Queen's Dolls' House, in which the photographs give a wonderful impression of the tiny rooms and furniture. Proceeds from the evening were £646 and flowers were presented to Ann Day and Clare Todd as a mark of appreciation for all the delicious food they have conjured up over the past three seasons - helping make the talks a monthly social event in Wootton.